I hope that also on you come here with tinsel in your eyes. We serve eggnog and mulled wine, we have nuts and candy, we have the sweetest of poetry for you. Soon it’s winter solstice and the days will slowly grow longer. This is a good time to rest and therefore the pub will be closed for 2 weeks. It’s time to think about what the new year might bring. Do you have plans or targets? Last year we had a target, and that was to finish another Anthology, and this time we wanted to have full control of the process. So the whole dVerse team has been active in selecting, editing, confirming with the authors and proofing. We have learned a lot, and it’s been fun. We underestimated the work, but finally we are ready. The book is ready for ordering on Amazon both in Europe and in North America. We set the price to 10 USD, but there are prices in Euro and Pound that corresponds to that. I have already placed an order for 10 copies. I missed the promocode Bookgift17 if you buy in USA or Canada, but apparently there are some discounts that may be applicable. If you want to check out the table of content you can find it here. There is still a chance to get the book before Christmas so for those of you who haven’t decided what to give for Christmas. We are planning to have an online Release Party that will be broadcasted live next year. I plan to invite you to read your own poem live. Details will come later. Hello all, and how great to finally be through with the anthology… it will be a wonderful reading again and again. And we got our first Amazon review from Glenn! Thank you! With Christmas coming and the start of a New Year already not now far away, some new stuff was published on my site yesterday. Hope you enjoy and looking forward to catching up with everyone else’s work later too. Thank you to all the dVerse team and all the poets who made our anthology possible. Please note that the promo code of bookgift17, expires on Nov. 14 at 11:59 Pacific Time. Wishing you all Happy Holidays and see you January 1, 2018! Code only for the US alas… but shipping is more expensive from US… My copies just shipped from Berlin. Good evening everyone on the last OLN Thursday of the year. I can’t believe that the anthology is finally available – I’ve put in my first order and am sure there will be another one after Christmas. Merry Christmas to all of our wonderful dVerse poets and best wishes for a wonderful, successful New year! I have already seen the sales report… and orders are coming in… My 10 copies just shipped from Berlin. Can’t wait to hold a copy in my hands! We do love the vibrant community… some have been here for many years and others are coming and going. So glad to have you among us Alison. 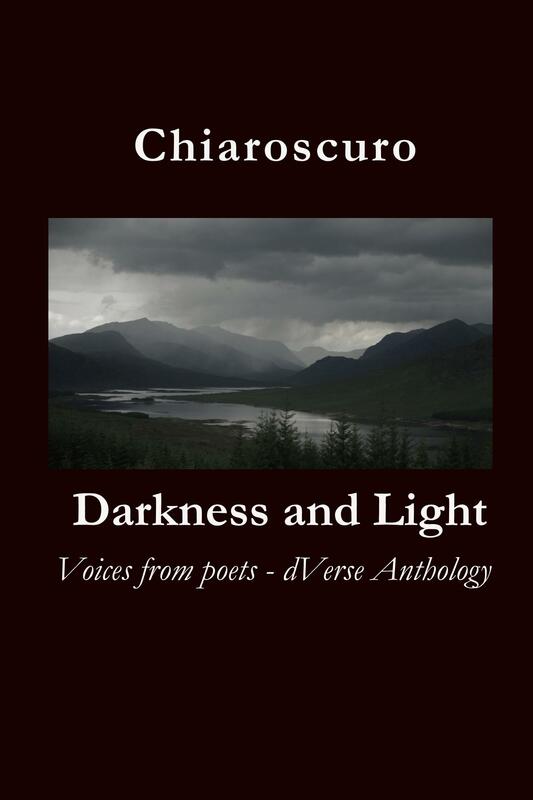 Well done, Bjorn and Grace, and everybody else who has contributed to Chiaroscuro. It sounds like a mammoth undertaking. I have cheated a little and linked a poem I put out earlier this month on my poetry Advent Calendar. I’ve put it up because it’s a bit Christmassy, and it’s Christmas. So there you go. Have a good one, everybody, look forward to linking up again next year! Thank you.. it was amazing thing to do. Merry Christmas, Happy Winter Solstice, etc. Bought the new anthology. Forgot about the promo code. LOL! A lot of work to select and publish anything but Amazon is a good place to do it. Thank you for hosting, Bjorn, and for all the work making the anthology a reality! It’s the best thing ever. Thanks so much to the Dverse team for the hard work it took to bring it out. The clock in the north being set an hour later has it way past my bedtime, so I’ll be doing more reading tomorrow. Thank you Petru… such a wonderful thing to hold a book in your hand. I danced through the house today after getting the email about it being available. It would probably take a few weeks. Partly due to our postal service too! A parcel from Australia took a month! Hello All. so exciting about the anthology. thank you Bjorn for hosting and thanks to you and Grace for all the hard work you put into it. It was fun, but the last part took longer than I thought. It is always the last part that seems to drag out. Toasting back… mulled wine or eggnog? Mulled wine, if you please. Cheers! What a nice surprise to have the Anthology available in time for Christmas. My hearty thanks to all who had a part in that happening! My wish for everyone is a blessed and peaceful holiday break. I’m looking forward to some of that mulled cider and curling up with my copy of the Anthology. Blessings on all! We pushed ourselves to make it happen… My copies have already shipped… and I ordered yesterday. Now it’s bedtime in Sweden… good night everyone.. Hope to see many orders coming in. Thank you, thank you, thank you to Bjorn and Grace for putting together this anthology. My first order is in and I can’t wait to start reading. I’ll be ordering more after the holidays. Hope all you pubsters enjoy some peaceful days during the break. Thank you Candy for being part of our journey! Wishing you and your family Happy Holidays! Peace to you as well for the coming new year! Thank you Erbiage for your support and best wishes ! spiked ‘nog coming up ~ A blessed Holiday to you and yours! Audrey, so good of you to join us for our last OLN for 2017. Happy and peaceful holidays to you and yours as well! I have been absent much…working on other things. But I am glad to get in on the last OLN of the year at least! Thanks Bjorn, Grace and team for all your work on this anthology. I’m looking forward to reading my copy. Enjoy your break! Hello Jennifer! Yes, so happy to see you linked up for our OLN of the year! Wishing you and your family Happy Holidays! So excited that the Anthology is out! I just got 5 copies with the promo code discount. I will likely buy more later. Gotta get back to work now, but will return soon to catch up on OLN offerings. Thanks to the whole dVerse team for your hard work on the book. Once again I come late to the bar. Life! I’m so blessed to be a part of this community and so happy to see the anthology published. Thank You Bjorn and Grace for your tireless work. Poem coming soon and reading tomorrow. I have a day off. Hurray. Catch up time. Thank you for all your work on making the anthology – which I just bought my copy. Your efforts are greatly appreciated, and I am humbled beyond words to be included. Happy Xmas, Happy Hanukkah, Happy New Year, Happy Holidays. Thank you for being part of our journey Buddah Mosk! Happy Holidays to you and yours! Hello everyone. Great job to all those who put this Anthology together. I am honored to be one of the poets contributing to this collection. Happy Holidays to you all and a blessed New Year. Happy holidays to you as well Arcadia ! Thanks for being part of our journey! Many thanks to Bjorn and Grace for making the Anthology a reality. You have given many the opportunity to be published in a book. dVerse is about community, poets and dreams. Hugs to all the staff who help keep the pub open. Merry Christmas and may 2018 bring new dreams! Hugs to you Truedessa for supporting and embracing our journey ~ Merry Christmas to you and your family ~ May the new year be a joyful one ! Evening, Poets! And a happy and safe Holiday season to every one! Thanks for hosting, Bjork, and I’m happy to hear the anthology is out! Congratulations, all! Today is the sixth anniversary of my father’s death. It’s also the fifth anniversary of the Sandy Hook Elementary school shooting. These two events shape the haibun I share tonight. So serve me an adult ‘nog, and a toast to us all on this last OLN of 2017. Milestones to remember Frank~ Here’s your ‘nog and cheers for a Happy Holiday!!! Wishing all of you a very Merry Christmas and happy holidays. Looking forward to reading more from all of you in the new year! Thanks to all for bringing a great group of poets together…happy new year!! Thanks so much for hosting Bjorn and many thanks too to all who have hosted across the year. The anthologies have arrived and I am chuffed to ribbons! Excellently executed they are – you (dVerse team) should be rightfully proud of a job well done! Merry Christmas and Happy Holiday to one and all. Oops – please delete the first ‘Anna’ – it wasn’t direct to the post and I didn’t know it had registered – until just now!. Cheers! I’ll miss DVerse over the next 2 weeks! Hoping to buy a copy of the book. Exciting news about the book! Thanks to all you fabulous bartenders for a year of excellent prompts. Happy New Year to All! Ah well, better late than never! Congratulations on the book, fellow poet-meisters! Cheers, all! Merry (fill in as you see fit) and a Happy New Year! Congratulations on the anthology! It’s early morning here, so I’ll just have some coffee, but I’ll have a cup of mulled wine later. I’ve added mine, and I’ll catch up with reading over the weekend. Happy Holidays, break, and New Year to all! I am new here and I wish you all a very happy start to the holidays this Christmas. Have lots of fun, bake and eat up. (That is one thing I love about Christmas environment in Western countries.). I will be watching few Christmas movies and most possibly join you all in the next year to read new poems and maybe write one myself… Have a great time ahead, everyone. Merry Christmas and Happy New Year in advance to you all. Welcome… there is still time to join with a poem before we close..
Sure, I will give it a try 🙂 Thanks for the encouragement. making a very late delivery between flitting to and fro to family – will have time next week to fully catch up but want to thank everyone for their support and especially our hosts at the bar. Also thank you for all the hard work putting together a very dense anthology – so many great poems. I was a little bit scared at first when I saw the number of poems in the book… it’s a very good value for money as Scott pointed out. My copy of the anthology is on its way to me and I am so pleased to be in it. Wishing all of you wonderful people a happy holiday season and some rest, if possib le. We shall start the new year off with brand new poems and hope in our hearts. Thank you for all the hard work you do, keeping this site going, and also putting the anthology together. It is a LOT of work!!!!!! You did well. Thank you for hosting Björn. Merry Christmas to all. I just ordered my copy of the Anthology. I am looking forward to the read. Again, Happy Holidays to all!! Thank you Pat ~ Happy Holidays to you too! My copy of the anthology arrived today! I atarted to page through it and felt like I was spending time with old friends. tonight I’ll make a big cup of tea and start reading from the beginning. This collection fills my heart. Thank you for being part of our journey Candy. So glad you are enjoying it. If you like or have time, please leave a review at Amazon. Happy Holidays! Thank you for being part of our journey. If you like or have the time, please leave a review at Amazon. Happy Holidays to you! Happy for the anthology…a big thanks to the dVerse team! Best wishes and happy celebrations to all. I tried to place my order but something went wrong…will do it after the vacation trip. Hope you can get a copy soon Sreeja ~ Happy celebrations too! Have a wonderful holiday reading time dear.. Thanks Bjorn, Grace and everyone who worked on this anthology. I just got mine and am enjoying reading it. Thank you all sooooo much! Thank you for letting me be a part of this community effort. huh. I’ve never heard of that font! It is wonderful to read, though. I can also read it without my glasses.